It’s a genuine news. Please find more details at the verification section of this article. Verification: Yes this is the correct information. 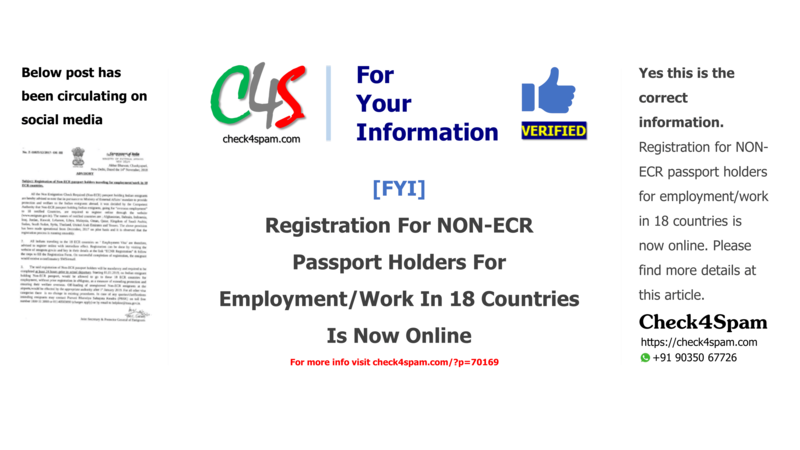 Registration for NON-ECR passport holders for employment/work in 18 countries is now online. What is Indian Passport ? An Indian passport is a passport issued by order of the President of India to Indian citizens for the purpose of international travel. It enables the bearer to travel internationally and serves as proof of Indian citizenship as per the Passports Act (1967). The Passport Seva (Passport Service) unit of the Consular, Passport & Visa (CPV) Division of the Ministry of External Affairs, functions as the central passport organisation, and is responsible for issuing Indian passports on demand to all eligible Indian citizens. Indian passports are issued at 93 passport offices located across India and at 162 Indian diplomatic missions abroad. Read more. Safety and protection of illiterate workers emigrating to certain countries for work is very important. So there are some formalities that has to be done before one leaves for employment in other country. “Emigration” means the leaving of Indian citizen with the intent of taking up employment in a foreign country. Protection Of Emigrants offices. Read more. Ministry is receiving representations regarding difficulties in online registrations on www.emigrate.gov.in, faced by Non-ECR passport holders already employed in ECR Countries. Read more.